It isn’t easy to review a book that consist of two different people arguing each side of an argument. In this case, it’s about whether Australia should pursue nuclear power, but my objections would serve for any book that worked in the same way. 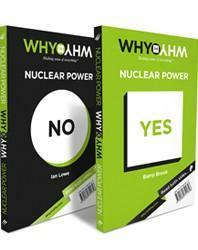 Why vs Why: Nuclear Power is written as a flipbook; each writer argues his case for or against nuclear power, and is then rebutted by the other. You can then flip the book to hear the opposing side, and its accompanying rebuttal. While this is a cute format, and perhaps a good way for people who don’t know the issues to get involved, it’s also rather aggravating. For one thing, the rebuttals, to some extent, only summarise the arguments written in the other half of the book. For another, each side of the book is by necessity so brief that the principles each argument is based upon can only be outlined; no actual data can be presented. As outlines, I consider the side against nuclear power to be a slightly more balanced portrayal, with admissions regarding how each side of the nuclear and coal debate deliberately chooses assumptions to support their own industries. The pro-nuclear argument is very much about the possibilities of nuclear power and every model run to support its use, without discussion of shortcomings and assumptions. The real issue of the book, for me at least, is that the two sides necessarily dig over the same ground and come to different conclusions. That is, they argue over the very facts which ought to decide the argument. For example, the pro-nuclear argument is based on the presumption that fast reactors and thorium reactors are employed and used to supply power. The anti-nuclear argument points out that fast reactors do not yet exist, despite work on their development for fifty years. The pro-nuclear side argues that reactors are safer than they have ever been, and can become safer – a claim I’m inclined to believe, based on the experience of France. Meanwhile, the anti-nuclear side argues that you cannot judge the safety of plants as yet unbuilt, particularly if they are to be the fast reactor, yet to be successfully demonstrated. They have different opinions on whether nuclear power will generate more plutonium, or less. Despite each side arguing their case, it’s difficult to come out of the book with any idea of which arguments are supportable, or any idea of real degrees of risk or threat. For what it’s worth, I personally don’t have strong feelings about nuclear power; I’m tentatively against it, but I could be convinced otherwise if the fast reactor problems, and hence the waste problems, were solved. I don’t particularly worry about the potential proliferation of nuclear weapons on the grounds that all sorts of people (who I would prefer didn’t) already have possession of sufficient weaponry to wipe most of us off the planet. I also don’t particularly worry about the effects of nuclear radiation for reasons outlined in Stewart Brand’s Whole Earth Manifesto, which showed that cancer rates for people and animals in close proximity are virtually normal. Regardless, neither argument succeeded in convincing me, if only because they reminded me of my siblings’ ‘Yes he did’/‘No he didn’t’ arguments. One thing I did like about the book was that both sides premise their arguments on the assumption that climate change is real and likely to be catastrophic, and we therefore need to transition to a carbon-free economy – as soon as possible. It’s a small thing, I know, but given how much false dissension is beat up in the media, I enjoy it being taken for granted. Yet, it did lead to me wonder why a major concern regarding nuclear use wasn’t mentioned, particularly in relation to the Australian case. It’s been demonstrated that a nuclear plant needs a comparable or greater amount of water to run than a coal plant, largely for cooling purposes – up to twenty-five per cent more water in some estimates. In the event of climate change, and the transition to a hotter, dryer climate, it’s very likely that available water will be at a higher temperature. Thus more water will be needed to effect the same cooling – in a climate where less water is available to begin with. This is a very real concern for the future use of nuclear power in Australia, and I was quite disappointed that neither side discussed it at all. Nuclear reactors don’t need fresh water for cooling. If they are sited near the coast sea water can be used for cooling and can be de-salinated for drinking at the same site. Thus more fresh water will be available (from that currently used by fossil fuel plants). You may like to stop and consider that solar panels and wind turbines, will need regular maintenance and cleaning to operate efficiently and, as they are more likely to be sited away from easily supplied fresh water costs of transporting water for that purpose will be high in CO2 emissions and dollars.